Tibet is notorious for being an expensive place to visit – current requirements are a pre-arranged tour including a Tibetan tour guide, Tibet travel permits, and sometimes a car and driver depending on your itinerary. Choosing the right Tibet tour package for your visit Tibet is very important. However, it shouldn’t be cut off your Tibet travel list because of worries like this; there are plenty of free things to do in Lhasa that will help backpackers and budget travelers to save their hard-earned pennies on the road. Once you arrive in Lhasa, the capital of Tibet, you’ll find that traveling to Tibet can be both cheap and rewarding, if you’re willing to be a little adventurous. 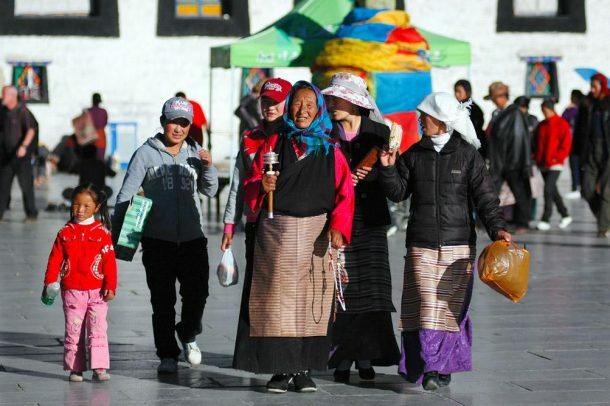 Here are the top five free things to do in Lhasa to help budget travelers in Tibet, because you don’t have to be rich to experience the richness of Tibetan culture! The Barkhor, or “Middle Circuit”, is the top destination in Lhasa for pilgrims from all over Tibet. 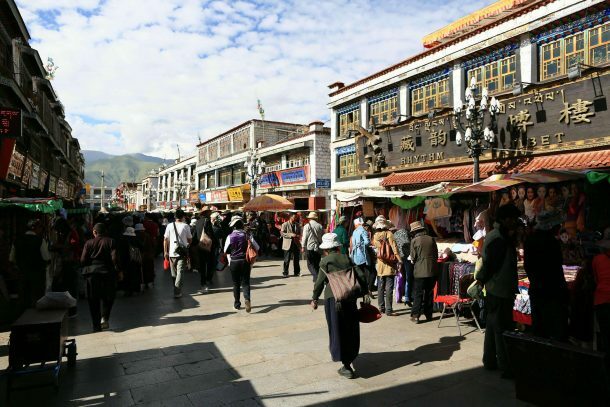 It is a road that circles around the sacred Jokhang Temple in the center of Lhasa’s old town. Each day from before sunrise until well after sunset locals, pilgrims, and tourists shuffle their way along its path while mumbling mantras and swinging prayer wheels. 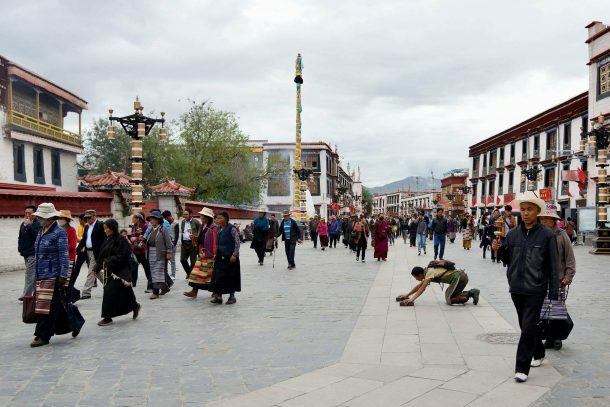 The early morning and late evening are the best times to go when the air is heavy with sweet smelling smoke from the giant incense burners at each corner of the circuit, and the road is filled with local Lhasa people going about their daily practice before or after work. Be sure to greet locals with a polite nod of the head, a giant smile, and “Tashi Delek” and you might find yourself being invited for tea! If you’re looking to escape the crowds, don’t be afraid to wander down any of the small alleys that head off the main Barkhor road, and get a taste of traditional life in Tibet’s biggest city. A “kora” is a trail that circumambulates a Buddhist holy site – often a monastery, a temple, or a mountain or lake in Tibet. One of the most easily accessible walks from downtown Lhasa is the Sera Monastery kora, just a ten-minute bus ride north of the Barkhor. The kora trail begins to the left just before the entrance gate to the monastery (where tourists must buy tickets to enter) and then follows the outer wall of the monastery all the way around and back to the gate in around 1-2 hours. If you’re in doubt about which way to go, follow the pilgrims and often they’ll be more than happy to adopt an interested traveller into their group, showing off all of the special activities that must be completed along the route such as washing your hands from a holy spring, taking a sip of water from the trunk of a tree, rubbing your knees against a clay wall, and making offerings to small shrines. All monasteries have a kora trail, some more adventurous than others, that are a great opportunity to experience Tibetan culture and scenery without paying a fee. Okay, this one isn’t technically free because you must spend money on food or tea, but everyone has to eat so this made the list as an alternative-to-restaurants destination. Rather than relying on restaurants recommended by your guidebook, with proper English menus, why not try one of the many hole-in-the-wall local teahouses that are scattered throughout the Barkhor. Their offerings are usually simple: momo (dumplings), took-ba or ten-took (broth with long or short noodles), and cha ngarmo/ suma/ or tang (sweet tea/ butter tea/ black salted tea). 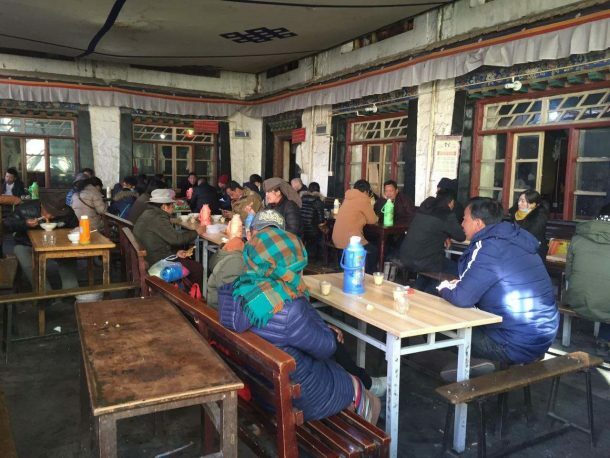 The reason why teahouses are counted as an “attraction” in Lhasa is simple – this is where you can observe and be included in daily Tibetan life. Over a few afternoon hours in a teahouse you’ll see mothers and their children sharing lunch, youths studying, elderly pilgrims taking a break, and sometimes a monk or two popping in on their day off from the monastery. While the language may be a barrier, smiling goes a long way and before long you’ll have made new friends without even saying a word. If the steep ticket prices put you off visiting too many of the main monasteries in Lhasa, why not go exploring in the old town and find the smaller temples that are more popular with locals than tourists. These temples are often overlooked by visitors due to their small size or lack of immense historical background, but despite this, they still have a lot to offer, especially if your visit is timed with either the full or new moon (the 15th and the 30th day of each Tibetan lunar month). Tsemonling Temple, down a small alley off Beijing Road, west of the famous Ramoche Temple, features several beautifully decorated rooms and becomes a hive of activity on these full and new moon days, when the courtyard packs full of elderly Tibetan pilgrims making offerings, spinning prayer wheels, and drinking tea together. Because these places aren’t yet tourist attractions, foreigners are still a novelty and you’ll be heartily welcomed by enthusiastic locals who all want to be a part of showing you around. Come prepared with a big smile and some biscuits to share, and you could stay all afternoon! 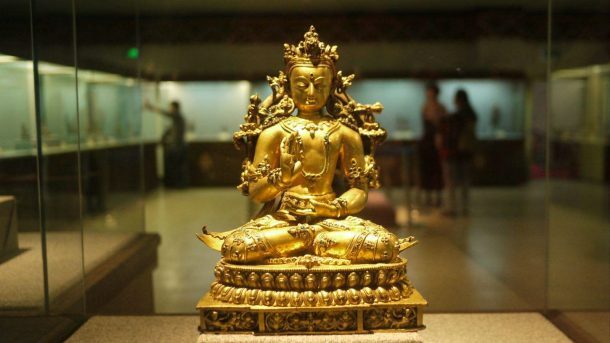 If your tour is hampered by bad weather, Tibet Museum is a great place to spend an hour or two exploring. Near the Norbulingka, in the west of Lhasa, Tibet Museum is free but sometimes has extra exhibitions which incur a small fee. The regular exhibits include ancient history, Buddhist artwork, daily cultural life, nomadic life, and many artifacts from the Dalai Lama’s Potala Palace and Norbulingka. Signs are in Chinese and English and aren’t as propaganda-filled as they once were, making for an interesting and insightful look at Tibet’s past and present. So what are you waiting for? If you want to travel cheaply in Tibet, contact our travel guides for more help arranging a budget tour in Lhasa (where you can check out for yourself these five free things to do in Lhasa) or anywhere across the Tibetan plateau. See our budget Tibet tours here, or send us an email with your queries here. We look forward to hearing from you! Previous postTibet Visa for Indian Citizens Next postIs Drinking Water Safe in Tibet?